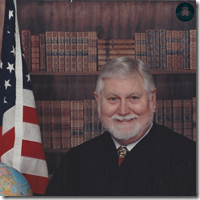 Judge Ed Butler was a Ford Foundation Scholar at Vanderbilt University School of Law, where he graduated with honors. For many years he was a Board Certified Civil Trial Attorney by both the Texas and National Boards. He is a retired federal judge; retired Naval Intelligence Commander; & former law school professor. His honors include the DAR Medal of Honor, SAR Gold Good Citizenship Medal, and he was selected to the Texas Genealogical Hall of Fame. He's listed in Who's Who in America & Who's Who in the World. He is a world traveler who has visited over 200 countries. In 1997-98 he and his wife traveled around the world for 14 months. It took two years of planning to stitch together an exciting trip including around-the-world air, train passes, tours, cruises, and independent travel. In 2003 they did it again in the opposite direction. He has written four books about travel, two law books, four on family history and two history books. In 2009-2010, he had the honor of serving as President General of the National Society Sons of the American Revolution, and through research and writing he has become an expert about the Spanish in the American Revolutionary War. In 2010, following a private audience with HRM Felipe VI de Borbon, King of Spain, he asked Judge Butler to write a book about Spain's assistance to the U.S. during the American Revolutionary War. That book has now won five awards and a TV documentary is planned. 5. ollo, Viking Duke of Normandy, and his Impact on France & England. 7. King Carlos III of Spain, America's Best Friend in the American Revolution. 12. King David of Scotland - Why Aren't All Kings Saints? * Accomplishments of Charlemagne, Emperor of the Holy Roman Empire (Germany, France, Italy, Austria, Hungary, Slovenia, Netherlands, Belgium, Corsica and the Balearic Islands). * Spain as an Ally During the American Revolutionary War (Spain, France, England, Gibraltar, American Colonies, Central America, Balearic Islands, Philippines). * France as an Ally During the American Revolutionary War (Spain, France, England, American Colonies). * Thomas Jefferson and Benjamin Franklin � Ambassadors to the French Court. * Sinking of the Spanish Armada & Taking of Cadiz. (Spain, England, Scotland, Ireland). John Paul Jones and his raids on English port cities (American Colonies, England, Spain). 1. Spain as an Ally During the American Revolutionary War (Spain, France, England, Gibraltar, American Colonies, Central America, Balearic Islands, Philippines). 2. France as an Ally During the American Revolutionary War (Spain, France, England, American Colonies). 3. Thomas Jefferson and Benjamin Franklin � Ambassadors to the French Court. 1. Pirates on the Spanish Main (Mexico, Cuba, Jamaica, Puerto Rico, Caribbean).